A few years ago, I purchased the book, Ruff Love, written by Susan Garrett. The program makes a ton of sense and I expect it works, the problem is, implementing it. I also have Building Blocks for Performance written by Bobbi Anderson, which is a program pretty much along the same lines as Ruff Love. To borrow Bobbi Anderson’s words, I have to be all that is heaven to Fern and believe me, that is very hard to do, although I have managed to do it with Gel, but it took a long time. The sad truth is, my dogs are allowed too much freedom because where I live, it’s easy to give it to them. I come home and I’m tired and would like nothing better than to put my feet up and watch television. Maybe with the time change, it will be easier. I am more of a morning person and now that it’s lighter in the morning, I can do the bulk of my training in the morning. One of my instructors told me that I needed to “rock Fern’s world” and that in order to do that, I needed to take away everything that she’s getting reinforcement out of and replace it with me and that I needed to be more exciting. Right now, Fern would rather play with Gel, Midge or the cats than me. I think perhaps I’m not a very exciting person. I must stop all the projects I’ve been doing around the house as they are sapping my energy. On Saturday I went to Lynne Stephen’s for a private lesson, then came back to the house and assisted Wally with making my agility table and finished up three more jumps. After we finished the table, we moved the A-frame over to where the rest of my equipment is located. We also lowered the dog walk to a foot off the ground for training (Fern and Midge) and so I could paint the legs. I need to put touch-up coat of paint on the A-frame as well. After we did all this, I went over to Wally’s house and we moved the sheep into the pasture where the goats were located and put the goats where the sheep were. Needless to say, when I got home, I crashed. On Sunday, I got the brainy idea of taking down the 15 foot long, five feet wide, five feet high wooden cat run that was running off the back of my house. The cat run was constructed about five years ago back when I was breeding cats. It has been slowly sinking down into the ground and needed to be taken down. I am planning on making a small storage building to put over by my agility field to store my tunnel, etc. when not in use. The run is down, but there is still a lot of work to do to get it picked up and either disposed of (some of the wood is rotten) or re-constructed into something else. The sad truth is, the run didn’t need to come down on Sunday. The dogs did get a lot of attention, but not much one-on-one time. I want a weekend were I can sit around and do nothing but train dogs. I just realized I haven’t written since Wednesday. We had a ball in class on Wednesday night. Gel is running really, really well and I’m starting to feel more comfortable running Excellent-level classes. After class, we let all of the dogs (Midge and Fern included) run around and play for a while. 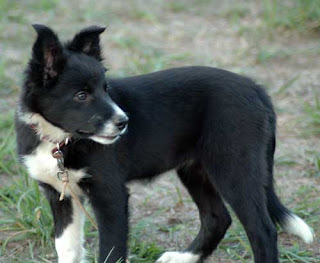 The neat thing about that is that one of the dogs in the class, an Aussie named Rose, had previously been attacked by a Border Collie and because of that was very reactive around Border Collies. On the night of our first class, her owner, Lillian, asked that I keep Gel out of the agility field when I wasn’t running him because Rose got so upset around Border Collies. In three weeks we’ve progressed from Gel staying out of the agility field, to Gel being in the agility field, to Gel, Midge and Fern being in the agility field and finally to all of them playing nicely together. During our first run last Wednesday, Midge and Fern got very excited when we ran by. Midge stood up on the x-pen, knocking it over on top of both dogs. I was running Gel and didn’t see it happen, when all of a sudden, Midge and Fern are out in the field running with us! They slithered out from under the collapsed x-pen as if it was something they did every day. They were not at all traumatized by it. The photo of Fern was taken on Friday, November 2, 2007. She’s starting to look less like a puppy and more like a dog. It looks like her ears are going to stand completely up and if so, she’s the only puppy in the litter with prick ears. She’s still quite small, which is fine by me. I got to see her next to Pyro this weekend and she’s about two-thirds the size of Pyro. I’ll be taking care of Monty (formerly Heatwave) this weekend which should be fun. I’ll be glad to see him again. It will be interesting to compare the three puppies given that Monty and Fern are both raw fed and Pyro is kibble-fed. One thing I noticed this weekend is that Pyro is much more clumsy and slower than Fern; she also tires out quicker. That could be due to the size difference, which is why comparing Monty to Pyro will be even more interesting given that Monty will be larger than Pyro.